Rotterdam is a great city to visit, well known for its harbour and architecture, and easy to reach. We encourage international train travel if you are travelling from countries close to Rotterdam. There are high speed trains from the UK (London is just 3 hours away) and France (Paris: 3 hours), Belgium and Germany and regular trains to many other destinations. Amsterdam Schiphol Airport is the world’s second largest international hub, serving 196 destinations. The airport is a 20 minute train ride from Rotterdam via high speed train. There are several direct flights to European destinations flying to Rotterdam The Hague Airport. Rotterdam has a good public transport network and is well connected to other Dutch cities via train. Rotterdam has many hotels that cater to all budgets. You can find Rotterdam hotels on Booking.com, Airbnb, or other booking websites. 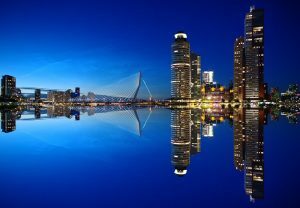 … why not visit the Rotterdam sights or one of the other tourist destinations in The Netherlands.